I wasn't sure how our two year old would take sitting through a 71 minute cartoon but I didn't care so much that he comprehend the story as latch on to the characters. This movie did the trick! He now knows all about "Mr. Tooo-d" and Mr. Badger, and Mr. Mole and the Water Rat. It's a good life, it is! This particular version of The Wind in the Willows is very slow moving. The voice of Mr. Mole got on my nerves. The animation was, I felt, a bit jerky. I thought it was made in the 80's and was surprised to find a 1994 tag on it. I would have thought it would have been a bit more clean and bold in color than it was. It felt old. However, it also felt accurate. 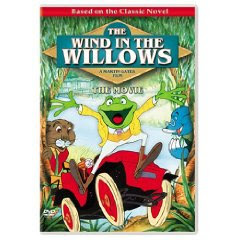 It's been awhile since I've read The Wind in the Willows but I felt like I was reading the book while watching this film. It's a fairly faithful adaptation. As my husband put it so succinctly - you can either read the book or watch this movie but you don't need to do both. (I might disagree just a little but I'll go with the spirit of the statement!) This movie follows the book well. I don't think our son understood the movie very well at all. However, as we watched I named the characters for him and talked about what they were doing so as to encourage comprehension. It would probably be an easier watch for a four year old, but he did ask to see it Mr. Tooo-d again the next day so he must have liked it at least a little. However, the main purpose in watching it being to prepare ourselves for our fun adventure and wild ride well, I think this did the trick! **I'll be posting a bit more about our Disneyland trip tomorrow but fyi - it helped to have seen The Wind in the Willows movie before riding Mr. Toad's Wild Ride. After our first ride, our young lad declared that the weasels were scary. However, he did eventually ask to go on it again. He was also happy to see Mr. Toad. I've always wondered why Toad is the more popular character. Personally, I prefer Water Rat. However, I rather consistantly "rank" as Moley. Which Wind in the Willows character are you?